A week removed from nearly defeating Booker T Washington, albeit in a preseason event, the North Marion Colts won their season opener on the road 17-6 over Blanche Ely. Freddie Swain and Kentrai Patterson scored second half touchdowns to lift North Marion to the win. North Marion (1-0) is scheduled to host Forest next week in their home opener providing their stadium is ready. North Marion is upgrading their facilities and will play the game at Forest if temporary seating is not available for the game. 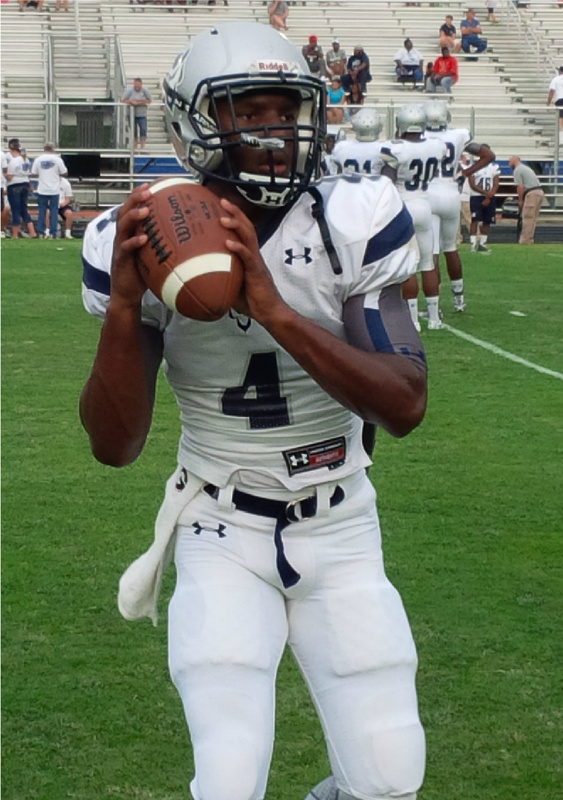 The Spartanburg (SC) Vikings opened the 2015 season on the road in a nationally televised game against Wakulla (FL). Wakulla scored first on a 24-yard Demarcus Lindsey touchdown run capping a 73-yard drive to put the War Eagles up 7-0. Spartanburg answered back on their first possession going 80 yards with all-world running back Tavien Feaster scoring on a 15-yard touchdown run to even the score 7-all. After forcing Wakulla over on downs, Spartanburg was set to take the lead but fumbled going into the endzone for a Wakulla touchback. The War Eagles lined up and went 80 yards on their next drive capping with a diving touchdown reception by Justin Davis from highly-touted recruit Feleipe Franks of 31-yards to take a 14-7 lead in the second quarter. From there it was all Spartanburg as they outscored Wakulla 35-0 the rest of the way. Tavaris Scott’s big reception down inside the Wakulla ten yard-line set up Spartanburg’s next score, a horse collar personal foul penalty on Wakulla gave the Vikings a first and goal inside the five. Feaster finished the 80-yard drive with a 10-yard touchdown run however the Vikings missed the extra point and trailed 14-13. That score would hold until halftime. The turning point in the contest came when Wakulla was forced to punt on their opening possession of the second half. Spartanburg’s Ayele Jeter blocked a quick kick punt by Franks, Jeron Davis returned it 30 yards for a Vikings touchdown. Scott his Feaster for the two-point conversion to give Spartanburg its first lead of the game 21-14 as Spartanburg never looked backed. Feaster-playing through a slight shoulder injury, continued to show why he’s a five-star recruit and the nation’s best all-purpose back after catching a 44-yard touchdown pass from Austin Scott on an under thrown ball extending Spartanburg’s lead to 28-14 with 2:01 remaining in the third quarter. Spartanburg put the game away in the fourth quarter with a pair of Austin Scott touchdown passes. Scott hit Tavaris Scott for a short touchdown pass then hit Marsalis Wilson for a 77-yard touchdown pass for a 42-14 lead which held as the final score. Spartanburg’s defense lead by Hezekiah Byrd, Louis Rodgers, Mike Murphy and Trey Smith shutout Wakulla in the second half while holding Feleipe Franks to 102 yards passing and a touchdown on 9-of-20. The War Eagles big-time receiver Keith Gavin was limited to 26 yards on five receptions by the Vikings’ defense. Feaster finished with 58 yards rushing two touchdowns while catching eight passes for 109 yards and a touchdown. Austin Scott passed for 336 yards on 22-32 with three touchdowns for Spartanburg. Spartanburg (1-0) will travel to Union County (0-1) next week while Wakulla (0-1) will host Cathedral Prep (PA). Mecole Hardeman is the headliner for the Elbert County Blue Devils but he isn’t the only one on the Elbert County roster with a knack for the big play. Latravious. Barnett returned the opening kickoff of the season 85 yards for a touchdown to give Elbert County a quick 6-0 lead. Cedar Shoals answered on its first possession with a 39-yard touchdown run by Jarmichael Baldwin as the Jaguars went in from 7-6 after a successful extra point. Two possessions later Barnett struck again breaking off a 63-yard run to the Cedar five. La’kel Hood finished the two-play drive on the next play with a 5-yard touchdown run. The Blue Devils converted the two-point play taking the 14-7, they would never trail again. Hardeman, a five-star recruit and AJC Super 11 selection, shook off an early fumble by warming up in the second quarter. Hardeman connected with Joseph Johnson for a 13-yard touchdown pass to put Elbert up 20-7. After Cedar Shoals punted Elbert County into a hole at their own six-yard line, Hardeman went back to work hitting Johnson on a 76-yard touchdown pass a few plays later giving the Blue Devils a 28-7 lead. Hardeman finished off his dominant second quarter with a 9-yard touchdown run with 37 second remaining to give Elbert County a commanding 34-7 lead. Cedar Shoals would add a touchdown as time expired in the second quarter on an Aakeem Glenn to Stavion Stevenson 12-yard pass to close the gap to 34-14 at the break. “He’s the best I’ve ever seen and I’ve seen some good ones, he does so much for our”, Elbert County head coach Sid Fritts said about Hardeman. In the second half the teams exchanged turnovers and punts before Elbert County’s Hood found the end zone on a 1-yard plunge early in the fourth quarter for his second rushing touchdown of the night, sealing the Blue Devils 40-14 victory. Elbert County (1-0) will host Stephens County (1-0) next week in their home opener. Stephens County defeated Franklin County 34-7. Cedar Shoals (0-1) will look to snap its 12-game losing streak and get head coach Scott Wilkins his first win since returning to Cedar Shoals after spending six years as an assistant at Athens Academy on September 11th when the Jaguars travel across town to face rival Clarke Central at Billy Henderson Stadium. Clarke Central (0-1) fell 24-21 at Hart County (1-0) to open their season after leading 21-14 at halftime. The Elbert County Blue Devils (Class 3A) travel to Athens, Ga to face the Cedar Shoals Jaguars (5A) in the 2015 season opener for both teams from Water-Wilkins Stadium. Live play-by-play coverage begins at 7:30pm et. Valdosta’s hail mary attempt on the final play of their game fell short, the Wildcats lost 34-31 to Norcross after leading 17-7 at one point in the first half in the only closely contested game of the 2015 Corky Kell Classic. For the second straight year the Corky Kell Classic played seven games-this year two on Friday at McEachern High School and five on Saturday at the Georgia Dome, this year six of the seven were decided by 28 points or more. Sandy Creek led 20-0 at halftime and went on to defeat Creekview 41-0. Archer-the preseason pick and highest nationally ranked team from Georgia in most major national polls, continued with a 49-21 win over North Paulding. In breakfast football the next morning Kell shutout Carrollton 35-0 with Bryce Armstrong scoring three non-offensive touchdowns. Armstrong returned two punts and a fumble for touchdowns as Kell cruised. Mill Creek, the largest school in all of Georgia and a lightning rod during GHSA proposals to go to seven classes next season- it passed, jumped on Brookwood quick and piled on the rest of the way for a 42-7 win. Defending 6A state champion Colquitt County had an offseason you don’t wish on your worst enemy. They put it to North Gwinnett quick and early then finished it late with a 45-14 win. It was the second-worst loss for North Gwinnett in the Bob Sphire era, which is in its 10th season. McEachern jumped on Tucker out the gate for a 14-0 lead and had 41 points by halftime. The Indians added a touchdown and safety in the second half while cruising to the 50-14 win. In seven games the total margin of victory was 209 points (a Corky Kell record), an average of 29.8 points. The winners won in the manner they should have. Every winner is a key factor and should play into late November and/or early December in the state and could play their way into more national discussions. For the losers, the depth of Georgia is questioned as this is the premiere event to open the high school football season and has been since 1992. Of the losers Tucker and North Gwinnett can rebound, you can add Carrolton in there for good measure. For the others, Creekview, North Paulding and Brookwood, they must go through a number of tough tasks just to make it to Thanksgiving playoff football. Booker T Washington will not put their Florida record 41-game winning streak officially on the line until next week against St. Thomas Aquinas- a private school heavily ranked high in national polls with an influx of transfer talent, but the Tornadoes got a strong test in their classic game against North Marion prior to that. North Marion went up 20-18 after a 99-yard kickoff return for a touchdown in the second half. The Colts would add more points, going up 27-18 in third quarter. From there Booker T Washington used 10-unanswered points and a blocked field goal to seal a 28-27 win over the stubborn Colts of North Marion. North Marion widely is considered a contending threat in Florida Class 5A in the southeast despite national projections. The Colts showed tonight, in a game that did not count, that are out for a special season. At points during the contest emotions/competitive fire ran high on both sides. Both teams exchanged unpleasant greetings with some slight pushing and shoving prior to the second half. “They showed me tonight they are the team I think they are. Full of heart and passion. Nothing but up from here,” North Marion second-year head coach Stephen Field said. North Marion opens the regular season next week against Blanche Ely followed by their home opener against Forest the next week. A date with Hoover in late October highlights North Marion’s schedule and will be televised nationally on ESPN 2. The contest against Hoover will be North Marion’s first out-of-state game in school history and the first nationally-televised game for a Marion County (FL) school in history. ‘We’ll play them, we’ll play anybody,” Field said when approached about the opportunity to play Hoover with no regard to the historically context of the game.